Journey into the wildlife refuges of Key West, a world untouched by the hands of man and find your distractions were left at the shoreline when you boarded our boat. 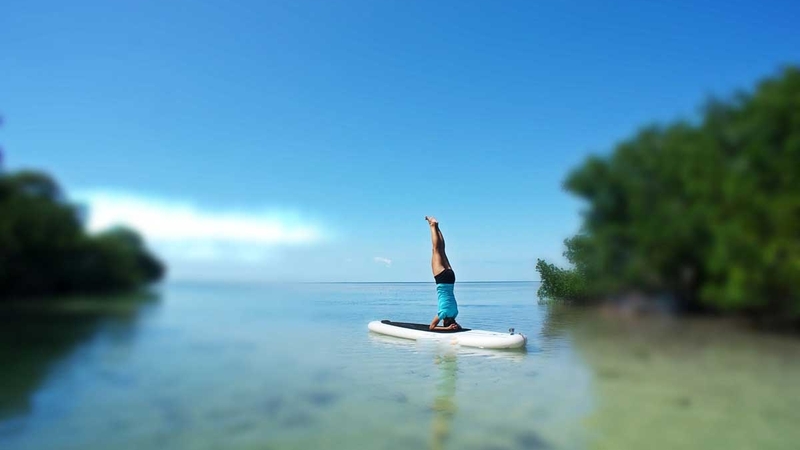 Yoga at Sea is a 4 1/2 hour boat trip that takes no more than 6 guests total into the wildlife refuges surrounding Key West. 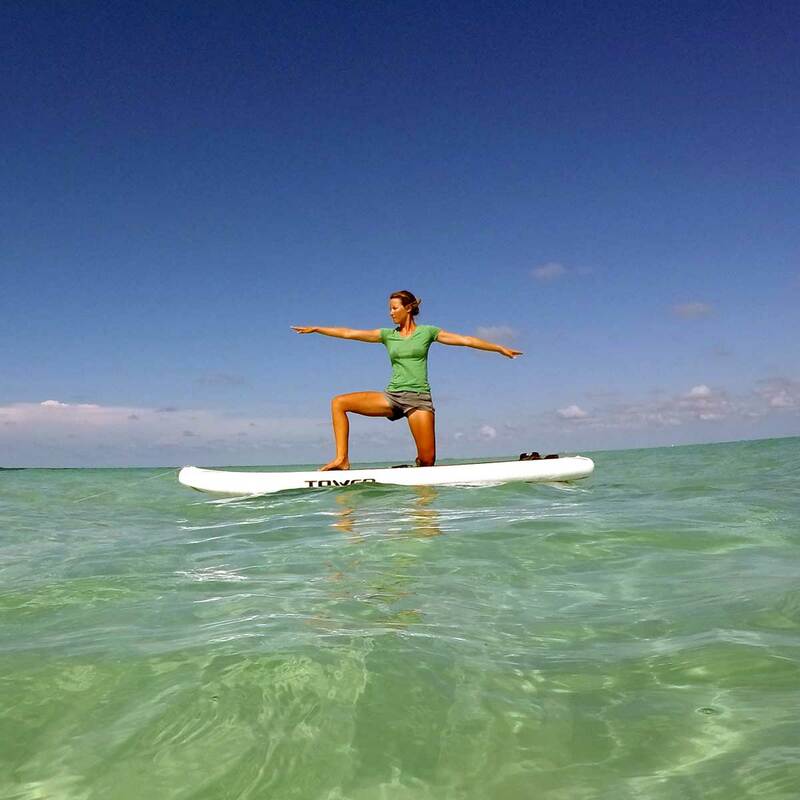 Conveniently departing from Old Town we travel into areas protected from wind, other boaters, and any distractions left at shore, providing idyllic scenery for paddleboard yoga and a guided nature tour. We serve vegan snacks, use a fuel efficient inboard motor and use reusable stainless water bottles all as part of our journey to be a company that works daily towards being responsible stewards of the Earth. Be yourself, floating serenely over calm turquoise waters, dissolving into relaxation as your finger tips are gently cooled by the water beneath. Transcend the everyday, with a restorative yoga practice as you move to the sounds of the wildlife that surrounds you. The yoga class is tailored to fit the needs of each individual student, while also being designed to give the greatest sense of relaxation, allowing students to find a deep sense of connection to the surrounding environment. Modified poses open this experience to individuals of all skill levels and experience. Observe as reddish egrets pirouet through the shallows, shading their eyes to help in their search for food, listen for the clattering cackle of the ever-shy clapper rail bird, immerse yourself in the landscape of a calm ocean dotted with islands comprised of mangroves, the stalwarts of the refuge. Captain Billy and Captain Stephanie were amazing. After we boarded the boat we took a comfortable ride out to a secluded mangrove island off Key West. Billy and Stephanie were very knowledgeable about the history and nature of the lower keys. After we dropped anchor the paddleboards were launched. I had never been on a paddleboard before but Stephanie gave everyone a brief but thorough lesson and I was up and paddling within minutes without any problem. 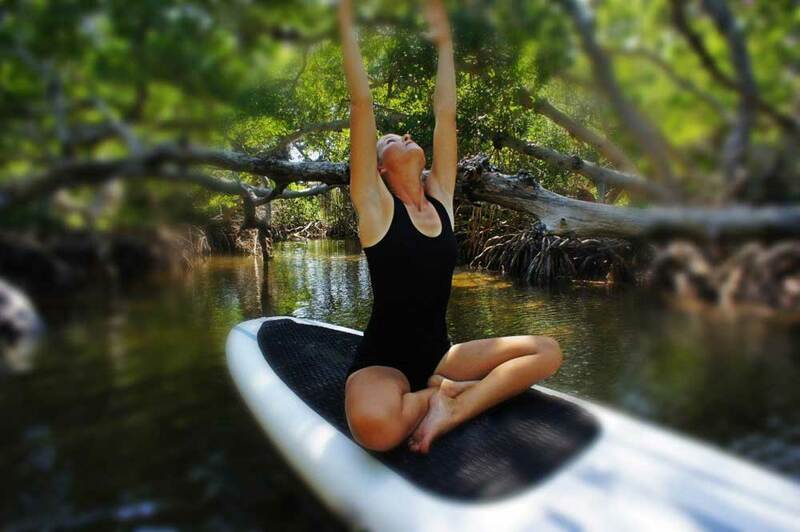 We paddled into the mangroves.We found a calm and peaceful cove and began our yoga session led by Stephanie. Within our group we had a few very experienced yogis and a few beginners and even a first-timer. Stephanie was really good about creating a yoga class that was enjoyable for everyone. Stephanie closed the yoga session with an incredible guided meditation. We concluded the yoga portion of the trip and then headed deeper into the mangroves. Billy and Stephanie were excellent guides and were able to point out the numerous animals and birds that make the ecology of the mangroves unique. Being out there on the paddleboards with just a small group was otherworldly. After the mangrove tour we headed back to the boat and enjoyed some fresh fruit they provided on our return trip to Key West. After arriving back at the dock Billy and Stephanie gave us some great restaurant and night-life recommendations. Billy even offered to have us call him anytime during the rest of our stay in Key West if we wanted further insight from a local about things to do. The crew, the yoga, the nature tour - all excellent! I highly recommend this trip. 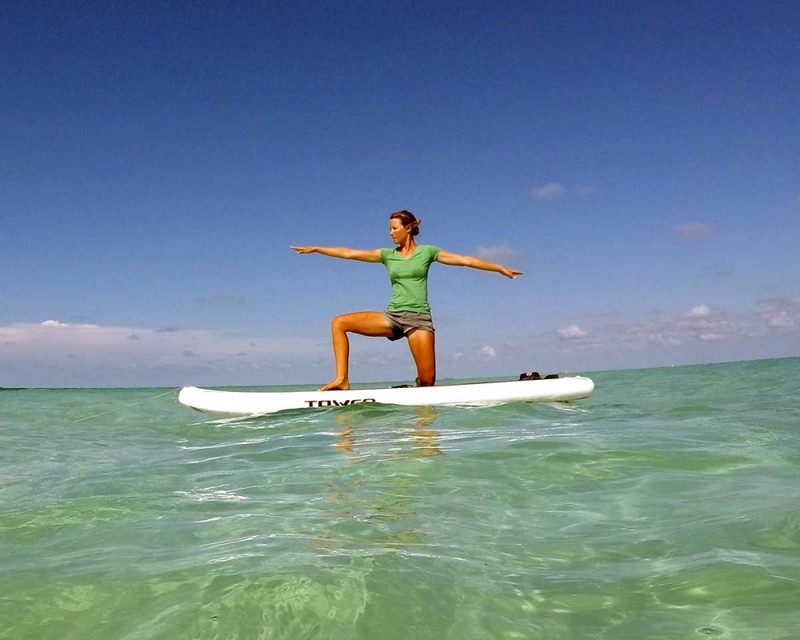 I know I’ll be going back out with Yoga at Sea next time I visit Key West. what a great afternoon! i’ll start by saying that i am a total beginner at yoga, though i have paddle boarded before. that said, i really didn’t know how my balance was going to hold up. not only was it fine, it was also a truly soothing experience. stephanie knew her stuff and provided easy to follow guidance. combine that with the setting, a remote, mangrove island miles from anything, and it was like nothing i’ve ever experienced. 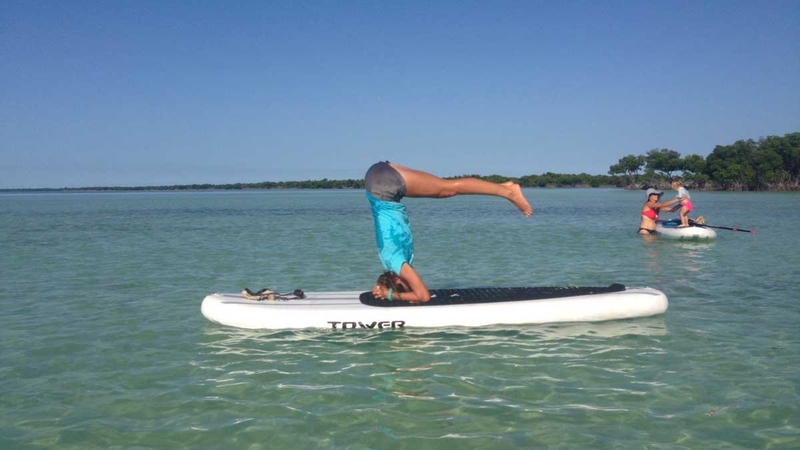 i would recommend this trip to anyone looking to get out on the water into the beautiful, natural back country, whether you are experienced with yoga or not!